promising to release the country from a new round of conflict. Abhisit is smart, educated and honest - it seems these are all the things the typical Thai voters don't want. But the Thai voters will not forget he was PM when he allowed the army in 2010 to act violently against his own people on the streets of Bangkok. Shooting civilians must be his own take on acting with integrity. Suspect the families of those shot may not quite understand his ethics. What would Abhisit know about democracy or integrity? Past experience showed he valued neither of them. Crackdown at Rajadamnoen : (April 10, 2010) - 24 dead, 800 injured; April 22 - 1 dead, 85 injured. Crackdown at Rajaprasong: (May 13-18, 2010) - 41 dead, >2100 injured. Has he spent the last 9 years at attitude adjustment camp? Integrity amongst Thailand cival servants ! Saddly that will never happen , and it is what Thailand needs most. nothing new: the usual politicians talks! Well he can cross himself of the list then. he had to let the army go in because those criminals - working on behalf of another criminal threatened to torch Thailand. It would have been the task of the police - but they did nothing - favouring the criminal abroad. His only mistake was not sending the army earlier. "Integrity".....that's about the funniest thing I ever heard coming from a Thai! Is it available on eBay or Lazada! And who paid those people to protest so that he could get "his" money back? The red shirts had war weapons, grenades, etc. and they had the MiB in the middle of them. Any peaceful protesters could have left anytime. The radicals who stayed knew what was coming. They took the risk to die for their super rich corrupt hero. And let's not forget the families of the protesting red shirts who died received many millions each. 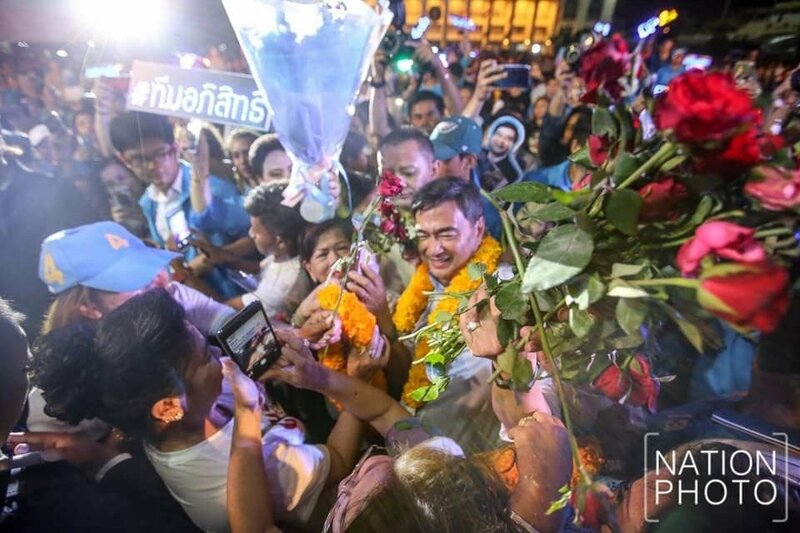 Abhisit ordered to clean up the streets. That should have been a police job but the tomato police did as usual nothing. The only mistake Abhisit made was that he waited too long. Only threatened? They burnt a couple of shopping malls, as is the want of mobs when they get a bit agro. Innocents, including nurses and journalists were killed by the military, directed by the corrupt Suthep and puppet Abhisit in the aftermath. The other mob of criminals, led by criminals (who came first BTW) did pretty much the same, shut down all the country's international airports causing billions of Baht damage to the economy, shut down government house, started a border conflict with Cambodia etc. I recall the army and police not doing much about that either, imagine taking over the country's main international airport unimpeded by security forces. The mind boggles. Anyway, I digress. Thaksin obsessives aside, the Democrats are un-electable thanks to the Chuan administration's policies in the late 90's which hit the rural poor hardest. Abhisit had the opportunity after the judicial coup in 2008 to make good on his promises and failed, even after giving the most corrupt faction in Thaksin's government the most lucrative posts to plunder at will. I can't think why he would be a better choice this time around. that's because they don't recognise them, they rarely see those qualities in anyone, including themselves.